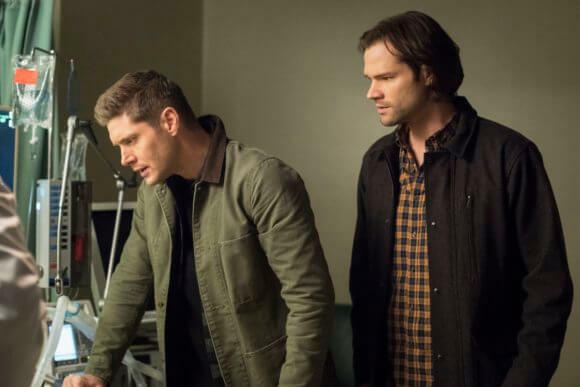 Supernatural Season 14 Episode 12 Recap: "Prophet and Loss"
The CW’s Supernatural showed how a single scene can change the way we perceive an entire episode. This week’s “Prophet and Loss” (season 14 episode 12) was a much slower affair than the previous episodes, which had featured a lot more happening. But it was the stinger that saved all of it and made watching everything unfurl completely worth it. We start off with Dean (Jensen Ackles) seemingly having completed his task of sealing himself in a coffin at the bottom of the ocean, panicking and calling for Sam. Thankfully, this was all a nightmare and we’re treated to a scene where Sam (Jared Padalecki) tries to talk his big brother out of going through with his suicidal plans. However, Dean’s mind is made up and he doesn’t want to talk about what just happened. It wreaked too much of season 10 where the plot went humdrum as every episode seemed to go this way; the time when Dean was suffering from the Mark of Cain. This frustrating pace is continued throughout the episode with a few additions. We then find out Sam’s already told Cas (Misha Collins) about these developments (cue in fans holding to their chests as their hearts melt seeing that we learn how close Cas and Sammy have become) only for Cas to inform him that he’s found nothing to extract Michael from Dean, and neither has Rowena. Dean and Sam are then shown on the road, where Dean tries to do the whole “deathbed apologies” routine to Sam who is in no mood for it. And for good reason because Dean doesn’t get to make this decision and then pretend he’s being some kind of martyr. We do get a nice teaser to next week’s ‘Lebanon’ with some references to John Winchester. The boys pick up the trail of a man who’s gone insane. In a major throwback to how the show had worked back in season one, this man’s gruesome antics are shown in excruciating detail as he kills innocent people without remorse – one woman drowned in salt water with her own blood; one man bound and his throat slit. After killing these people, the man carves Enochian symbols onto them. After a little old-fashioned FBI snooping, the boys gather from Castiel that the insane man is Tony Alvarez – the next prophet in line after Donatello. But there’s a catch; Donatello’s still alive. In a change from the norm, we get the confrontation with the villain earlier on as the brothers prevent Tony from burning his next victim. Tony claims God has spoken to him to commit these atrocities (doesn’t sound much like Chuck, though, does it?) and kills himself when he can’t hear the voice anymore. This doesn’t change anything, however, as the next prophet in line is bound to go crazy the way Tony did, which leads to the only option: plugging Donatello out of life support. After we get a nice view of Castiel posing as “Dr. Novak,” full with donning a doctor’s coat, the three don’t go through with unplugging Donatello as Sam learns from Donatello’s doctor that the latter had been awake recently and chanted something in Enochian. A hopeful Castiel realizes Donatello’s mind is attempting to repair itself and vows to heal him, wanting to atone for putting Donatello in this state in the first place. Plans go the right way for the heroes for once and Donatello’s healed, although he can’t recall what happened to him. Outside, Dean finds a half-drunk Sam by the Impala. Dean tries to start his martyr schtick again only for Sam to shut him up. Sam tells Dean he’s looked up to him all his life and, after saving the world so many times before, Dean’s just quitting now. Sam doesn’t agree with Dean’s decision because he’s giving up rather than fighting how Donatello just did. Dean does his usual non-committal response and gets the just reaction for it from Sam: he gets punched by his little brother. Sam isn’t holding back, though, and keeps admonishing Dean while going for another punch. An astonished Dean holds him back before Sammy goes in for a full-on hug loving embrace. Sam appeals to Dean while holding him tight and we see Dean’s facade melting as the person he loves the most cries in his arms. Dean agrees to do it Sam’s way for now, but asks both his brother and Castiel to promise they will let him go into that box if they can’t destroy Michael permanently. While they do agree, Sam remains distraught at the prospect – in a lovely display of brotherly emotion by the actor. It becomes clear that Nick has no plans to let Lucifer go, even though it meant it would finally free his long-suffering wife. Nick heads back from the house, leaving his wife to suffer on her own once again; his streak of vengeance ultimately only being a cover up to his real intentions to get Lucifer back. Overall, “Prophet and Loss” was almost entirely a slow burner. It didn’t pick up even once as the episode stuck to its slow pace. However, the saving grace, and ultimately the scene of the season, was the emotional confrontation between Sam and Dean at the end. While the two love each other, we haven’t seen these emotions seep to the surface in a long time, and this was a beautiful reminder just how deep their love is. Long-term fans will no doubt shed tears watching this scene as it reminds them how long we’ve stuck with these two, and with the promise of season 15 confirmed, we’ll have more time to spend with these Winchester boys. Saim Cheeda is a freelance entertainment writer whose work has been published on Screen Rant, Fansided, and The Gamer, among others. Saim also runs his own lifestyle blog called 3 States Apart. He's followed 'Supernatural' from the very first episode in 2005 and doesn't plan on stopping anytime soon.